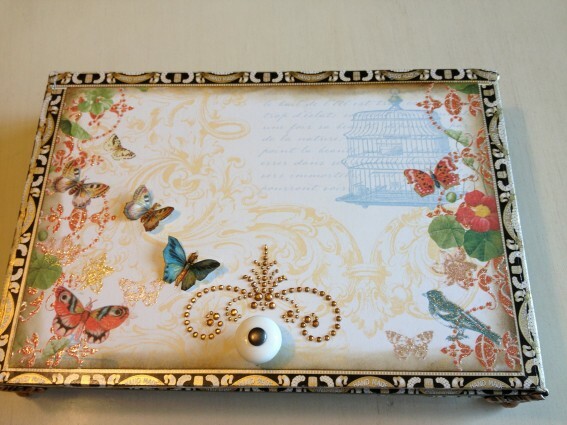 What a touching letter I received from Jim…a beautiful way to love and remember your mother at the holidays. 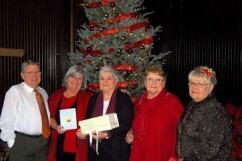 Wanted to let you know that I presented my wife and sisters with copies of The God Box and their own personal God Boxes that I had made from the dress our Mothers wore to our wedding. Needless to save there were some tears of joy shed around the table. This was our First Annual “Let’s Celebrate Mary Party” as this is the first Christmas without her and her birthday is December 18; she would have been 91. 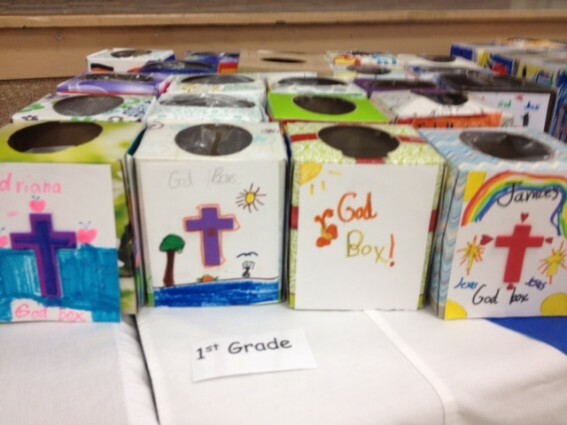 Now you have God Boxes throughout the tristate area. I have attached some pictures so you can see the festivities-they were thrilled to hear you also were a “Cardinal Dougherty” girl! I received these wonderful words from Britta Jicks whose memories of her Mom and whose approach to the God Box might just make your day. Made mine! My Mom was a kindred spirit much like yours and my best friend. I was so upset on Saturday. It was the first time her birthday came since her passing on March 3, 2012. I was there to do the hospice for her at her home along with my siblings. Anyway a wave of depression settled on me, and I needed an answer. I found it in the God Box on Sunday with your app suggestion. 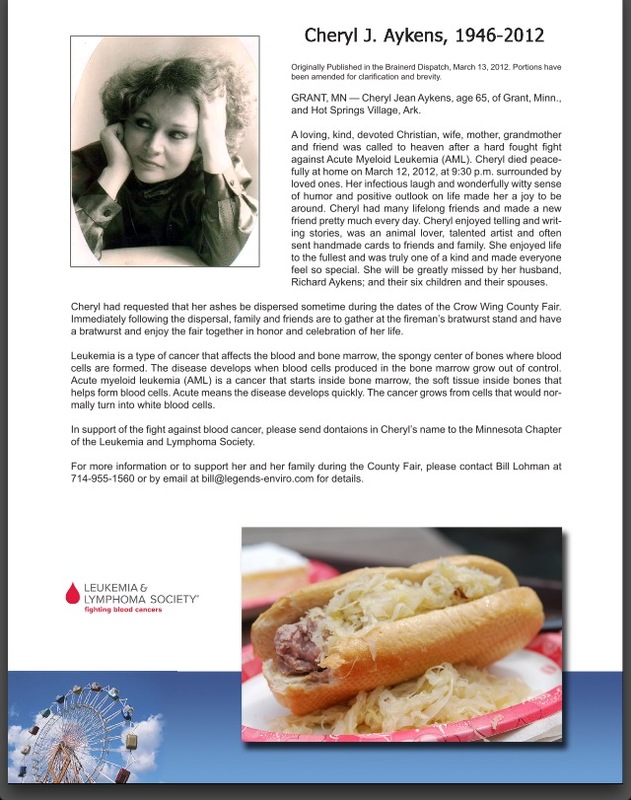 When my Mom was diagnosed with AML, I quit telling her all the problems/prayers I started talking to Jesus/God. 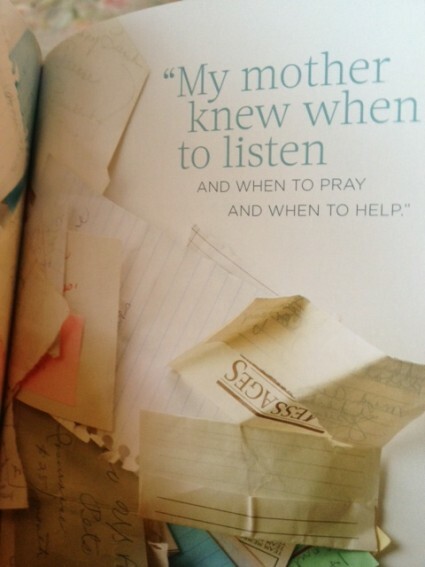 Before I had told Mom and after I’d share or she would share we would pray and she was my prayer release. We would, and when we came up with a plan/prayer, we’d say,”The rat is on the wheel” and then laugh. I have found cards, notes, stories etc from my Mom too. Thank you for sharing your Mom and helping me find a way to let go and let God. The notebooks and journals…I never felt that I had let go. I do in this way, I love it and it was so great to have this blessing from your Mom. Thanks Mary Lou. Last night I joined in a book discussion with the wonderful women of the Berwyn Presbyterian Church in Berwyn Heights, Maryland, just outside Washington DC…without even leaving NYC. Denise Troeschel had written and asked if I could speak with them about “The God Box” so we set up a Sunday night Skype call. Denise (who was born exactly three days before me and whose mother had the exact same handwriting as mine!) was a terrific host. She even made a God Box out of a cigar box, big enough to hold lots of prayers. I am still thinking about that. Curious, how would you answer that question? This letter from Janice meant so much to me. I’m so grateful when Mom’s story touches others..
My mother died one week ago and my coping mechanism has always been reading. Since she was 85 years old with some young grandchildren whose parents were concerned about how much to allow them to be involved, I went to the bookstore. In addition to buying many children’s books, I found The God Box. I read it overnight and finished it in church the next day. What a treasure! I have since purchased 6 copies as gifts to siblings and many friends. Wish I had known of this book years ago. There are only 2 entries in my God Box since this week, but I have to say, I do feel some relief. There is incredible sadness over my mother’s very peaceful, quick death, but I just think that the lessons will help in all aspects of my life. Your book was a gift to me and I thank you for that. If you have a story to share please write to me at hello@theGodBoxproject.com or please post comments here! I love receiving letters like these, it makes me so grateful when Mom’s story touches others.. I picked up the God Box book as a gift for my son’s phenomenal third grade teacher, Joan, who has been teaching for over 30 years. Her mom is 91 and she has been very ill this past year. Her mom – Anne, says a rosary each day and has been doing so since the age of 20. I have a special fondness for the Blessed Mother and was so touched to hear this. I believe Anne is still alive. I thought your book may help Joan through her mom’s transition to heaven, whenever that may be. It may be a while as I recall a day toward the end of the school year when I asked Joan about her mom just after they shared a discussion about possibly moving her mom to a facility where she could receive constant care. Anne’s response to her daughter was along the lines of although she seemed to be ready for heaven, God still had special plans for her. I am hopeful that Joan has read your book over the summer and that it brings her some comfort. I have since bought several more copies to share with friends who are going through difficult times now. It has also brought incredible comfort to me. After I finished your book, our family was struck with many challenging situations. I truly believe that it was God’s plan that I read your book as a way to let me know that although there would be some dark days ahead, God had better plans for me than I could imagine. My mom was recently hospitalized for three weeks due to OCD, anxiety and depression. Although a woman of great faith she has struggled for years. She has tremendous difficulty letting go and letting God truly guide her. She was just released a week ago and has still had some challenges. I am encouraged that she will slowly recover and be able to be more faith filled. I think your book will be a blessing for her. After reading your book, I sometimes wished that I had a mom as strong as your mom to guide me as many times I have felt like a mother to my mom. But I now understand that God has different plans for us and we need to let go and follow them. Thank you for helping me to better understand this. Two weeks ago today, my husband was laid off. He did not see this coming as he had just booked a trip to Disney World for our family around Christmas. He was shattered. I however had great peace. I knew the stress of his job was killing him physically and emotionally. I even asked during the weeks prior what I should do about his mom should he die. I wasn’t sure I could handle the grief of losing him while raising our two sons without him and take care of his ailing mother. I truly believe that your book somehow inspired me to look at things differently. I did not fall apart when he told me he lost his job, I actually felt blessed. So many miracles have happened since then, that I am certain that this is God’s plan. I see that you will be at St. Joseph’s University in the coming weeks. I hope to meet you then if possible to thank you personally for touching me in such a special way. Thank you so much for reading my story and I hope to meet you in person. Jenifer Santoro is a writer, daughter, wife and stay at home mother of two. A woman grounded in her christian faith, Jenifer uses her God Box as a means to surrender her thoughts, concerns and prayers to God. Another major component of her God Box, though, is the appreciation she has for God’s favor. 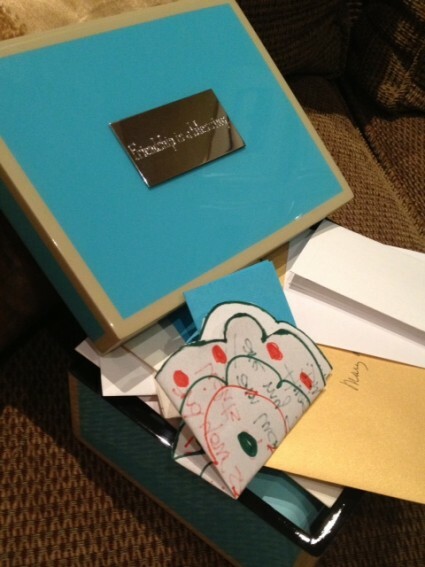 As much as her Box is used for requests, it is equally filled with notes of gratitude for all of the blessings in her life. Since reading Mary Lou’s story, Jenifer has been able to incorporate two of her life’s loves, faith and writing, together in a way that frees her from worry and uneasiness. When it goes it the Box, it goes to God, and there is nothing He can’t handle. When not working on her novel about faith and forgiveness, Jenifer writes about “Words with Gratitude, Grace and Gumption” and can be followed at www.prosewithpoise.wordpress.com. 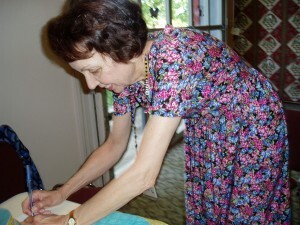 Helen Wolf, an amazing writer, quilter and teacher wrote to me about a three day show called the Quilt and Garden Festival at the Pearl S. Buck Center in Perkasie, PA. Helen, who loved The God Box book decided to take the concept into her own hands–literally! 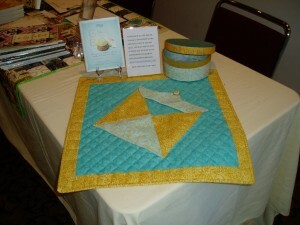 She made a quilt that was a fabric God Box and invited attendees to place their own notes inside. 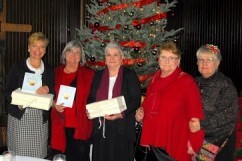 We contributed books to the event to support the center…the result? Dozens of prayers slipped inside and as many hearts, lifted! Hoping to teach a writing class with Helen at Delaware Valley Community College in the Fall and also to skype into her group of writers who quilt!